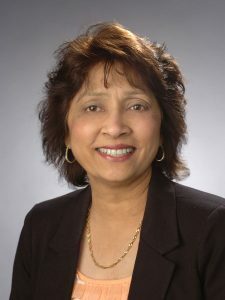 When Kalpana “Kal” Srinivas left her native India to come to the U.S. as a young woman, she was already well educated. This was in large part due to the efforts of her mother, whose own education had come to a halt at the age of 13, when she was part of an arranged marriage to a 19-year-old man. Determined that her daughters would have more opportunities than she had been given, Kal’s mother sent them to a convent boarding school where the Catholic nuns had a reputation for excellence in teaching and discipline. Kal was a good student who continued on to college after convent school. She earned a degree in biology and chemistry from Rajasthan University with an eye on becoming a physician. But Indian medical schools required a monetary donation from the student’s family that hers couldn’t provide, so her dreams of further education were put on hold. The honors have been pouring in since Kal completed her dissertation, which explored the effect of participation in Syracuse University Project Advance and advanced placement on student persistence and performance. She is being nominated for a doctoral dissertation award at the School of Education, crediting the quality and rigor of her work—one faculty member referred to it as one of the strongest dissertations reviewed by him. She was also nominated to be the Student Speaker at the School of Education’s Convocation. And Kal will be the Graduate School’s Class Marshal at the 2013 Commencement in the Carrier Dome. She has been invited to share her research results at a Professional Development Seminar at University of Wisconsin in Oshkosh with its own concurrent enrollment program. She has been asked to spearhead a multi-institutional research study by National Alliance of Concurrent Enrollment Partnerships (NACEP).